As you may know through our Twitter @LucyAndLydia, we announced last night that we are flying to America today for a Disneyworld trip to Florida! We are ‘Disney Obsessed’ so you can imagine how excited we are for this trip! We both love getting organised and choosing what essentials we need to take with us so we thought that a blogpost would be really helpful for any of you guys that may be travelling to Orlando too! I also love this kind of blog post, I love to see what other people take with them in their hand luggage and what they need for their long haul flights! From the photo above, you can see that we are taking our laptop in our hand luggage too! Hello, It’s Lucy typing! I thought I would firstly go through what I will be taking with me on my flight. Lucy’s name comes before Lydia’s so I’m going first! Obviously the most important thing to take and remember to take is your passport! That’s something you really don’t want to forget! 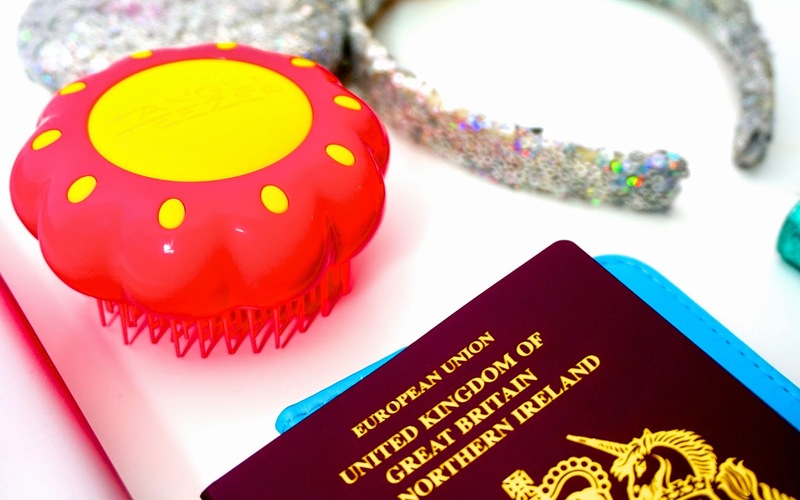 Next to my passport is my Flower Tangle Teezer. This is my all time favourite Tangle Teezer as I think it is super cute with the flower shape and great to carry in my hand luggage! I love how girly it is! As we are going to Florida, Disney Minnie Mouse ears are a must, you can’t go to Disney without them. I have an original pair of Minnie Mouse ears which I have packed in my case and I’ve packed my Sequinned Minnie Mouse ears in my hand luggage. These were actually purchased on ASOS and I wore them in our most latest trip to Florida which was in September. I will be wearing these around the parks! 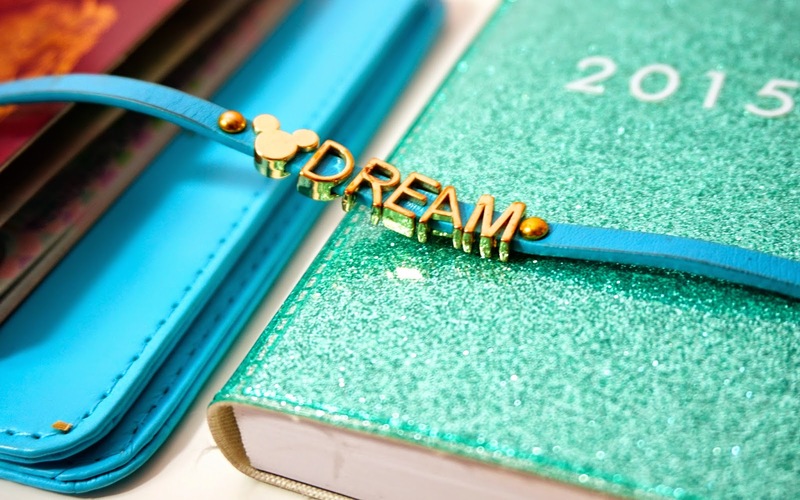 Also Disney related, I will be taking my ‘Dream’ bracelet which I got from one of the Disney stores at Epcot Park last year. This is the only time when you can get away with Disney related jewellery so I will be wearing all of mine! I have a few of these bracelets and they look so cute stacked together. I am also going to be packing my sparkly 2015 Diary with me on the flight, which I purchased from Paperchase. Plane Journey’s are the perfect time where you can sit back and plan what you want to do in the year. It will be a chance to go through my diary and create a schedule for YouTube, but also for life and planning other holidays! Last but not least are my headphones! I got these headphones a couple of days ago and I am obsessed with them! I purchased a Disney Satchel Bag for our last Florida trip and when I saw these headphones in Primark with the matching pattern, there was no question, I had to buy them! Lydia was a little jealous when I got home and showed her. You can find these headphones in the Childrens section in Primark, and they were only £9.00! 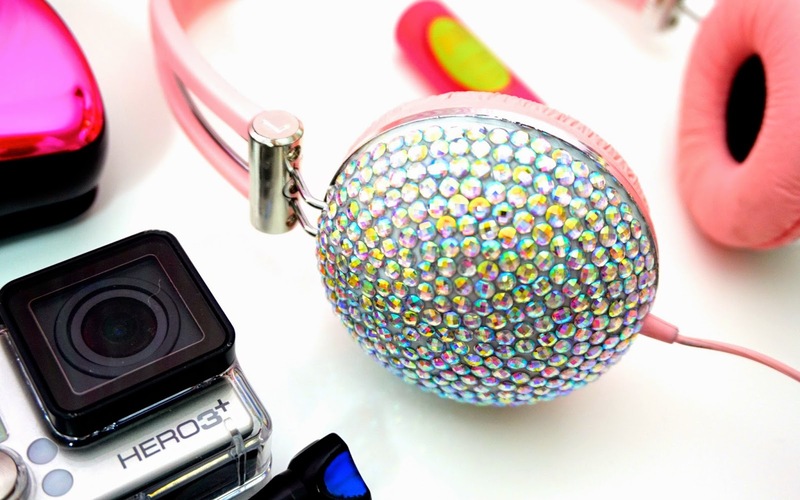 Absolute bargain for such cute headphones! They are also really good quality too, they cancel out noise around you and play your music really loudly, which I have to have as I love listening to my music really loudly. I can’t be without music on a flight so these are essential for them long plane journeys! It’s Lydia! As you can see from the photo above, I am an over packer! I pack so much with me, I think it’s because I don’t like the thought of not having something with me which I really need. You can also see that I am a bit of a gadget girl! I like to have all my gadgets with me on a long flight, to entertain myself. I think my favourite gadget of all is the Go Pro! Go Pro’s are the best camera’s to use in Florida, I love the wide angle it creates and it’s the perfect camera to take on water rides too. The selfie stick is something I am going to be taking with me around the parks so we can capture those perfect selfies! I purchased this selfie stick on Ebay, and it also came with a little aqua blue remote to match! I am a little obsessed with aqua blue. Talking technology and gadgets, I will also be taking my portable charger! I can’t go anywhere without it these days. If you follow us on Twitter you will know my phone never lasts a whole day charged so I have to carry this around with me. As you can see, I also have a compact Tangle Teezer to take with me. My hair is really long so this is essential to put in my bag, and it’s the perfect size! The biggest thing that you all probably noticed straight away are the lemon sherbets, I know I’m not the only one that has sweets for the flight? Our Mum always said we needed sweeties on the plane! I am taking my favourite Kiss and Blush in No.9 for a 2-in-1 lip and cheek product. You all know how much of a staple product this is in my makeup bag and that I can’t live without it. This product gives the perfect natural dusty pink/mauve colour to my lips and also it gives my cheeks a rosy flush which I find looks so natural with my skin tone. The Kiss and Blush is a velvet matte so it means that it is really comfortable to wear but they it also feel s super creamy too. As it's a two in one product, it then means I don’t have to take extra in my hand luggage! While we are out in Florida, we will be Instagramming our trip too. Make sure you head over to both of our Instagram's to see our photos, we will also be doing day by day blog posts about our trip so keep a look out for those too! We will also be showing lots of photo’s from our trip on here! We are now just about to board the plane now! Speak to you all when we are in Orlando! We are just way too excited for Disneyworld! oh my goodness!!! I was just about to ask that lol!! I love them!! But seriously... where did she get them? 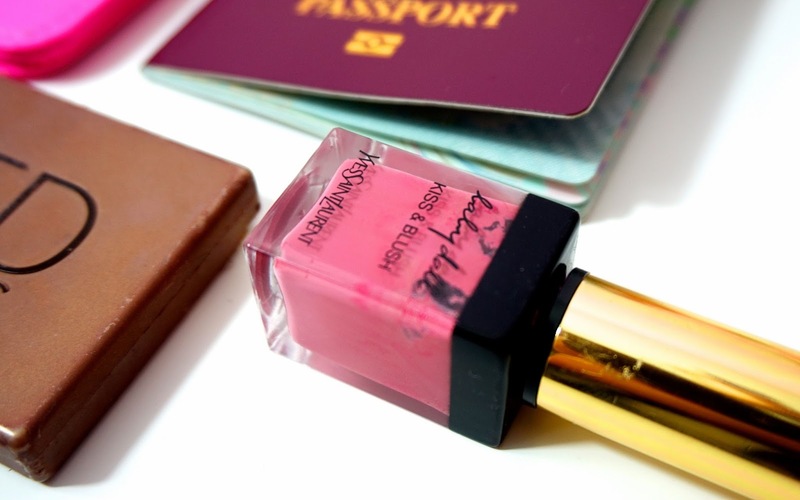 Those Minnie Mouse ears are so cute too, and dying to try the YSL Kiss & Blush! Loved your disney Gadgets! However I wish there will be such an amusement park like DisneyLand in my hidden Paris. 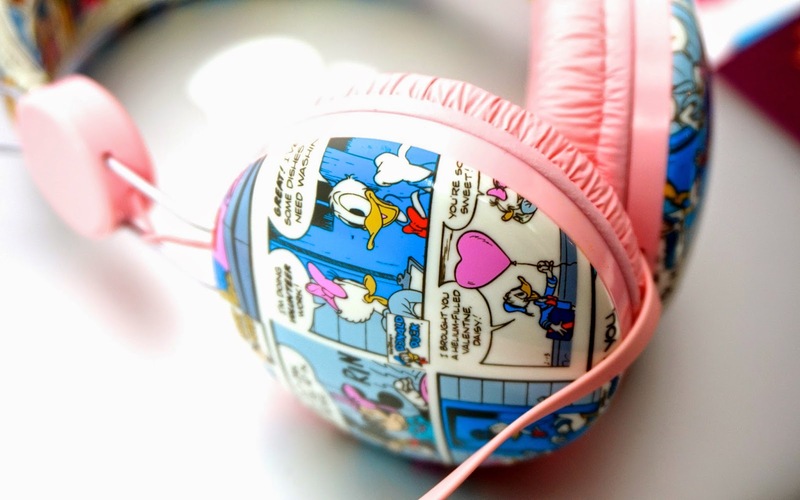 Oh my gosh, those Donald headphones are a dream! =O He is my favorite Disney character and we JUST were in Disneyland like, a week ago! I wish I had these! =[ I would never take them off! Very good essentials for travel but taxi is also an essential for tour that we provide you we are Detroit airport taxi . Awesome your post, it’s really helpful for all travelers. Do you love tailgating? Yes! Oh, we love it too! And we will be happy to make your tailgating experience one to fondly remember always by presenting to you Miami Tailgating Limo.